What could we do to make the lives of our clients and administrators easier? What would impact their financial budget, support their procurement processes, and stage our cost-effective Infrastructure solutions to become the one stop brand for the ever-changing technology landscape in the public sector? After reaching out to 200+ Public Organizations to better understand the needs of the Technology Directors, Procurement Staff, and remaining stakeholders, the answer became clear... Infradapt’s turnkey solutions are now available on PEPPM! What does that mean to your educational/ local government agency? Since the PEPPM purchasing contract has been already pre-vetted by the PEPPM Cooperative, you can bypass the expensive and time consuming RFP and bidding process and can purchase Infradapt’s VoIP Telecommunications and Cloud Managed Services products with confidence directly through the PEPPM market place! Your order will then be filled by Infradapt’s dedicated PEPPM staff, and you will be contacted to begin tailoring your solution’s deployment! To better explain the concept behind Pennsylvania Education Purchasing Program for Microcomputer’s (PEPPM) success at helping educational organizations spend less money and time on the bidding process, please refer to the next section about the history of the Central Susquehanna Intermediate Unit’s cooperative purchasing program initiative! Originating in 1982, Pennsylvania Educational Purchasing Program for Microcomputers [PEPPM] is a nationwide cooperative contract created to assist government agencies and educational organizations fulfill their bidding requirements for procurement. The PEPPM cooperative purchasing program is administrated by the Central Susquehanna Intermediate Unit (CSIU). Pennsylvania currently has 29 Intermediate Units that provide for various needs of school districts as defined geographically within the state of Pennsylvania. Typically, an intermediate unit, such as the Central Susquehanna Intermediate Unit, answers directly to the Pennsylvania State Department of Education. In doing so, they provide structure and organization around various aspects of their designated school districts’ infrastructure including: VoIP Telephony & E-911 Compliance standards, Wireless Solutions, Leased Fiber Services, E-Rate Consultation, and more! Taking on a more prominent role than most other Intermediate Units, the CSIU conducts PEPPM, and is therefore responsible for the technology services not only in their districts, but also in various charter schools, public schools, technical and vocational schools as well as other IU’s in Pennsylvania in addition to other government agencies. Who is an eligible buyer for PEPPM? In addition to the eligible pubic organizations listed above, PEPPM bidders in Pennsylvania, government services and education buyers in over 40 states use PEPPM contracts when it comes time to purchase new telephony solutions, hardware, cloud services or other technology for schools or agencies that they provide for PEPPM-Authorized Solutions. Through PEPPM, CSIU has worked with Infradapt to realize our efforts to provide education and government services buyers with a way to place orders, obtain quotes and seek pre-sale or post-sale on-site local and remote support, and most of all- receive not just hardware, but the guarantee that the solution will function for the life of its subscription. This is all done with one flat rate price. Unlimited Remote & On Site Support. and the Infradapt Guarantee. What is the Infradapt Guarantee? Why pay more for a solution that is not tailored to your environment and not guaranteed to work? Through PEPPM, Infradapt strives to work hand in hand with the CSIU to provide educational and government buyers with access to our product line aimed at saving school district dollars while providing them with the most cost effective and flexible platforms on the market! All Tailored. All Deployed. All Maintained. All Guaranteed. All one Price. How Does PEPPM Bid Process Work? There are three phases an educational or government buyer must go through when they want to place an order through the PEPPM bid process. The buyer does research on the product or services they are seeking to purchase. This research is best done through contacting an Infradapt PEPPM Sales specialist who will take the time to understand the needs of the organization, and help guide them through the pricing catalog made available through the PEPPM website and catalog store. The sales specialist will then provide the eligible entity with all quantity discounts, further product details, and a final quote with designated SKU’s and quantities. If the recommended assistance and quote were provided by Infradapt sales staff provides the buyer with the relevant documentation of the quote that has been issued against that vendor’s or re-seller’s contract with PEPPM. The buyer then faxes this information to PEPPM. If they found their product and price information through the PEPPM website, they print out their purchase order and any quotes provided to them by vendors, and fax this information to PEPPM. If the price and product information was found through Epylon eCommerce, the buyer can create their purchase order electronically through the Epylon eCommerce system. During a business week, PEPPM / CSIU staff will check any purchase orders faxed to them in order to verify the price and product information are correct, and the purchase order complies with PEPPM’s contract standards – all within a 24 hour period. If all of these criteria are met, then PEPPM staff will place the purchase order on the Epylon eCommerce system on the customer’s behalf. After the ordering phase, Infradapt will receive an email or fax notification automatically. In the case of faxes, any attached paper quotes are added to the Epylon purchase order, this consists of a copy of the fax itself. Buyers can log into their Epylon eCommerce accounts to check the status of their order. Infradapt also receives a notification of the purchase order in our Epylon eCommerce account. In addition to the advantages of the PEPPM bid system mentioned above, others include more electronic orders being directed to Infradapt and an easier transition from traditional order processing methods, such as faxes, to the eCommerce system. 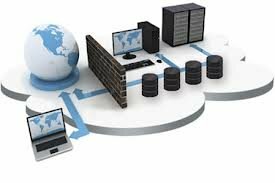 There are a numerous amount of institutions that can utilize PEPPM to order their technology infrastructure services. While the core program was originally educational institutions such as public schools and universities, which can use the PEPPM bid system as an affordable way to provide their students with the technology infrastructure that they need to complete their studies, such as cloud services, software, hardware and printer ink. Other institutions that can benefit include state government, local government and other institutions that serve the public, such as libraries. Out of the three, libraries in particular benefit from the PEPPM bid program the most. Much like educational institutions, libraries can use the PEPPM bid system as a way to satisfy the technology needs of the people who come through their doors. The main benefit of using PEPPM is the vendor agreements that require PEPPM-affiliated vendors to provide their best local education agency (LEA) pricing, ensuring the buyer will get the lowest prices possible. Order tracking: Because orders are tracked through the Epylon eCommerce system, they leave an electronic trail and can be traced in case any orders end up lost. Bids protected by an electronic archive: All orders are stored on the Epylon eCommerce system, allowing buyers to take advantage of the data protection technology Epylon offers, which includes an extensive backup. Orders reported back to the buyer: The PEPPM program provides a report of all purchases made during the year to date on a quarterly basis — all orders, including fax and eCommerce orders, are tracked on the buyer’s account. Infradapt's VoIP PBX offers all-inclusive cloud phone system featuring HD video meetings, unified voice, fax, text, audio conferencing, and detailed reporting. Hosted PBX eliminates on-premise systems, making it easy to manage multiple office locations, and simple to connect and scale your business and distributed workforce. Whether on Premise or Cloud Hosted, VoIP PBX systems provide mobility to employees, flexibility when a business expands, and are easier to manage than the traditional PBX. Infradapt's engineering team has been widely recognized as leaders in the converged networking and communications field. Collectively responsible for hundreds of telephony projects and VoIP implementations, the Infradapt team has the experience to make converged networking work for your organization. 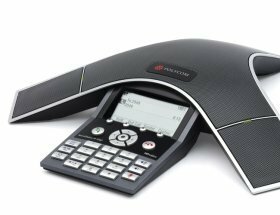 After years of experience selling and deploying proprietary telephony solutions from Avaya, Cisco and Mitel, Infradapt moved into more open telephony architectures, due to the lack of flexibility of the proprietary solutions available at the time. 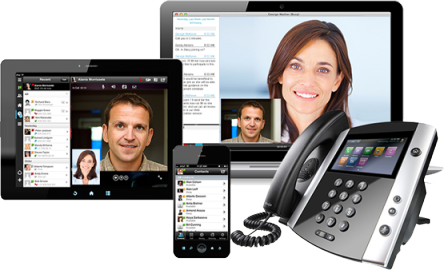 Infradapt is an early adopter of VoIP and Open-Source Telephony platforms. Our first Asterisk "The Open-Source PBX" implementations date back to 2002. We have already deployed more 20,000 telephony endpoints and we support client locations spreading through and 12 different states PA, NJ, DE, IL, FL, CA, TX, OH, AL, OR, LA, VA; Washington, DC as well as international locations in Canada and South America. We deliver multi-site expertise, SIP trunking, Unified Communications, even fax to desktop efficiency. Whether deploying a simple single-location PBX solution using traditional copper or designing an international multi-location MPLS-based solution, Infradapt has demonstrated experience and expertise. Infradapt performs an extensive pre-sale consultation, evaluating network capacity, application requirements, existing call flows (if applicable), current trunk and carrier services utilization, as well as disaster recovery and business continuity considerations to develop the most effective solution for your organization's needs. In most cases, Infradapt is able to eliminate waste, upgrade equipment and services, and ultimately deliver a complete platform upgrade while reducing long-term operating costs. Infradapt has extensive experience assisting its customers to make the move outside of restrictive legacy platforms and gracefully extend the capabilities of such platforms. Whether seeking a "no downtime" migration path or simply to enable remote access to an older system, Infradapt can deliver quickly and reliably. Infradapt brings to the table extensive expertise on new and legacy telephony architectures, ensuring a seamless transition away from legacy systems or integration with legacy systems due to industry specific requirements. Contact an Infradapt Solutions Specialist online or call 1-800-394-2301 to explore how Infradapt's Distributed IP Telephony solutions can benefit your organization. Infradapt is recognized to be among the industry's most capable providers of Open-Source Telephony solutions. Leveraging on our team's extensive experience assisting global enterprises deploy IP Telephony environments, Infradapt deployed our first Hosted PBX Platform in 2006, using a combination of open-source and proprietary components. Asterisk is the most widely used Open Source PBX software in the world surpassing the number of installations of traditional vendors of proprietary IP Telephony like Cisco, Nortel and Avaya. Infradapt proprietary software modules and methods are used to suit the Asterisk Open Source PBX to your business needs. Available as a one-stop communications turn-key solution, Infradapt offers a total communication hosted infrastructure solution for businesses. The Turn-Key Business Platform includes phone service, backup-phone service, manages services and integrated unified e-mail service. Infradapt is a Microsoft, Dell, Digium, Polycom, Adtran, Cisco, VMware Solution Provider. All partner products and solutions are available to our customers in and Fixed Rate monthly model. Our hosted voice platform, in particular, can be replicated and run from our customer's own datacenters allowing for an extremely flexible enterprise communication platform, that is much easier to manage and more cost effective than other competitive proprietary VoIP solutions. Please consult an Infradapt Solutions Specialist for any specific product needs. Ideal for Small Office and Home Office (SoHo) applications, Infradapt's affordable, hosted VoIP telephone system solution offers all the features, customization, and flexibility of an enterprise VoIP system. Choose from a variety of phone sets, calling plans including unlimited* domestic and/or international options and advanced features. 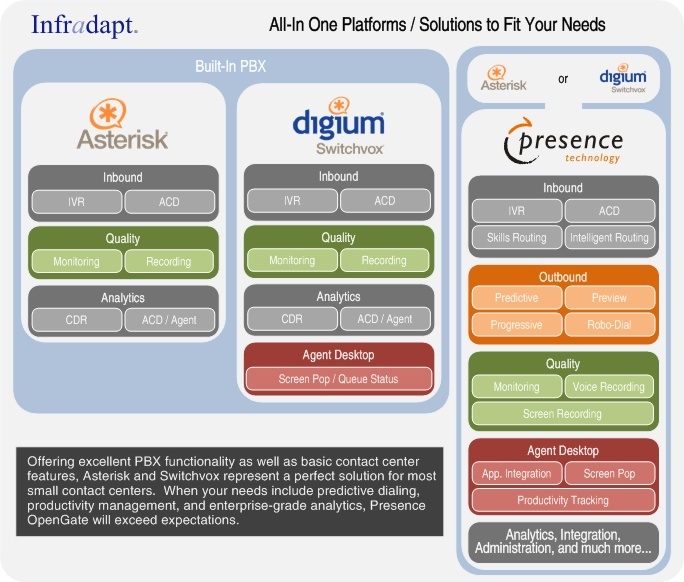 Improve sales force productivity and deliver top-line business value with hosted predictive dialing and CRM integration. Infradapt offers a fully-managed predictive dialing and intelligent call routing platform as an enhancement to its telephony backbone. 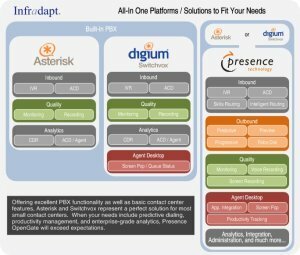 Infradapt offers a full range of contact center solutions based on-premises, ready-to-go in the cloud, or hybrid deployments. Whether you're looking for a fully outsourced solution including telecommunications services or a co-managed approach, Infradapt can help you make an informed decision and quickly get you started. A hosted solution offers many advantages over on-premise equipment, including built-in redundancy and expertise, reduced initial investment, faster go-live, and other benefits. Infradapt's hosted platform solutions are monitored for high-availability 24/7 and designed to be highly resilient. All hosted solutions include full access to Infradapt's 24-hour help desk and operations center so you will never have to worry about where to get help when you need it. 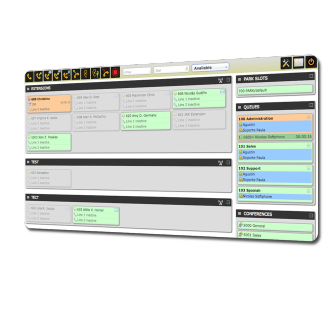 Infradapt has extensive contact center deployment and operations expertise ranging from stand-alone applications to integrated multi-interaction suites. From design, through deployment, and ongoing support, we can help your organization achieve its communications needs. Even if your organization is small, improving customer call experiences can improve the bottom line. Keeping existing customers content is significantly more cost-effective than finding their replacements. By analyzing customer interactions with your platform, abandonment rates, hold times, and other data, Infradapt can help you reduce or eliminate frustration points and deliver a better experience. Appropriate and timely reporting tools are essential to the success of any contact center platform. Infradapt can work with your operations team to define key performance indicators and adapt built-in reports to your organization's needs. Additionally, custom analytic solutions including cross-platform reporting engines (Crystal Reports and JasperReports) are available to make sure all actionable information is captured and presented in the most effective manner possible. As part of any deployment, Infradapt's project management team makes sure things go smoothly. A dedicated project manager will be assigned to your project to coordinate logistics, manage schedules, and keep everyone in sync. Infradapt's 24-hour helpdesk is always available to support your network, computer, and telephony needs. Whether responding to a basic configuration question or a carrier outage, our front-line engineers will work with you to diagnose your problem, ensuring rapid resolution. Periodic strategic consulting to review the effectiveness of your platform and operations will ensure that your organization continues to have the most efficient and cost-effective solution in place. Our relationship is an ongoing commitment to ensure capabilities meet requirements at the correct price point. 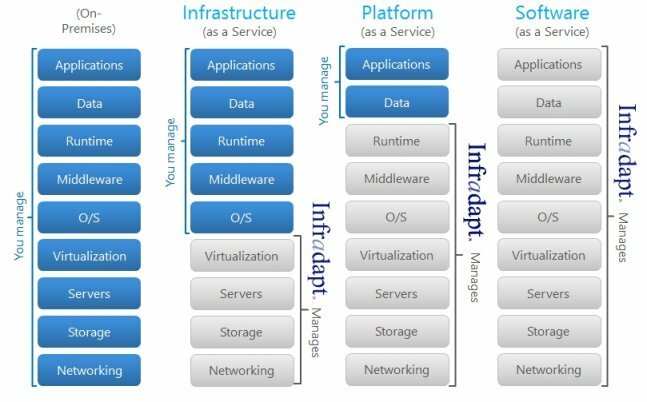 Whether you are expanding and opening a new site or confronting the limitations of an aging voice or data platform, Infradapt can implement your InfraPremise project from start to finish - evaluating system requirements, building a business case, and ultimately installing and supporting your ideal environment. The goal of any migration or initial rollout is a smooth transition while keeping business disruption to a minimum. Infradapt assigns an experienced project management team that has coordinated solution implementations in industries as diverse as aerospace, healthcare, manufacturing, retail, and financial services. From integrating with a legacy platform, to porting numbers between carriers, even migrating departments in phases, Infradapt has the experience to deliver on-time and on-budget. Our clients have confidence because we have done it before. Most organizations deploying a new PBX only enable just enough features to mimic a previous system, missing a valuable opportunity. As part of a PBX deployment, Infradapt will work with you to develop a plan to activate the most appropriate features for your organization and then conduct user, supervisor, or administrator training as needed. The goal is to ensure you achieve the maximum organizational benefit, including productivity enhancements. We operate in a similar fashion with regards to hardware and software, rigorously reviewing requirements and achieving the most cost-effective deployment of resources to meet both current and anticipated needs. Ultimately, every site will experience some form of power or telecommunications service disruption to the point where callers will be unable to reach their system. In many cases, no cost to low-cost options are available from your carrier that will allow service to be redirected around such an outage. Additionally, Infradapt can offer an optional business continuity service from its cloud voice platform that can sustain your organization through an extended site emergency or outage. 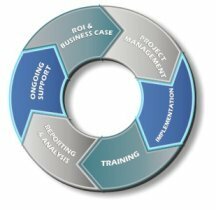 Infradapt analyses many factors when completing a project Return on Investment (ROI) study for an organization. Beyond the basic equipment replacement ROI, maintenance cost reduction, lease buyout or replacement advantage, etc. Infradapt also looks at how current and proposed infrastructure is being consumed. Phone and Internet costs are reviewed, carrier traffic studies are performed, and ultimately the most cost-effective solution is proposed for your organization. In many cases follow-up (and ongoing) post-implementation consumption studies can be performed to make sure your organization is not overspending on data and telecommunications hardware and software or underestimating demand and missing opportunities. Infradapt will work with your preferred lender should you wish to finance your infrastructure investment. Additionally, we have already qualified several of the industry's top financial services firms to offer turn-key equipment financing for our solutions. In most cases, an offer from one of these firms can even be included with a proposal or price quotation. Ask an Infradapt solutions specialist for more information about taking advantage of these offers. Infradapt offers a full range of professional services including a 24/7 helpdesk and monitoring service to help support your critical operations. Whether the need is application integration, on-screen scripting, custom report design, or emergency operations support, Infradapt can help you maximize your contact center investments. Infradapt is a Dell, Digium, Polycom, Adtran, Cisco and Ruckus Partner, VMware Solution Provider and Microsoft Cloud Services Provider. All partner products and solutions are available to our clients in and Fixed Rate monthly model. Contact an Infradapt Solutions Specialist online or call 1-800-394-2301 to explore how Infradapt's Distributed IP Telephony solutions can benefit your organization.